Photo by: Jeri Tidwell Photography. The holidays couldn’t arrive soon enough for many folks, and the spirit of Christmas in more ways than one is alive and well at Toby’s, the Dinner Theatre of Columbia. Charles Dickens’ beloved classic 1843 novella, A Christmas Carol, with its familiar characters featuring Ebenezer Scrooge, Bob Cratchit, Tiny Tim, Jacob Marley and various ghosts of Christmases—past, present and future—is presented with high energy in Toby’s in-the-round venue for what is an entertaining musical production. David James (who also plays Crachit) directs A Christmas Carol at Toby’s with a skillful touch and a keen attention to detail. The two-time Helen Hayes winner helms a lively, well-paced production, managing a large cast blending Toby’s veterans with new performers through the musical numbers, special effects, tons of props and a plethora of costume changes. Many of the characters’ good attributes as well as shortcomings in A Christmas Carol related in some manner to Dickens’ own life’s experiences that included struggling to make ends meet and witnessing his father hauled off to debtor’s prison while he was a young lad in London. The imaginative story centers on the miserly Ebenezer Scrooge (played strongly by David Bosley-Reynolds) and his Christmas Eve to Christmas Day evolution from when he began as a mean, arrogant and friendless soul to one that ended up as a caring, generous human being embodying the true meaning of the Christmas holiday spirit. Speaking of spirit or in this case spirits, the extraordinary transformation in Scrooge’s personality was accomplished through the supernatural nocturnal visits from three ghosts: one representing Christmas Past (Heather Beck), one from Christmas Present (Darren McDonnell) and one from Christmas Future (Mackenzie Newbury). Through song and dialogue, these ghosts call out Scrooge’s failures, the effects of his actions, and the consequences that could occur in the future. Several of the songs stand out and are performed well under the musical direction by Pamela Witt and the six-piece orchestra. Among them: “A Place Called Home,” “You Mean More to Me” (a tender ballad performed sweetly by Mr. James as Cratchit and Lucas Bromberg as Tiny Tim), “Link By Link” (a superbly executed production number), “The Lights of Long Ago,” Fezziwig’s Annual Christmas Ball” (a stirring production number), “Abundance and Charity” (another excellent production number), “Christmas Together,” and the Finale. The lyrics work well with the dialogue and actions on stage to propel the story. For those wonderful production numbers, credit Laurie Newton for the impeccable, high-energy choreography. Splendid vocals added to the joy. As Marley, Andrew Horn’s tenor voice excels in “Link By Link.” MaryKate Brouillet who plays Emily, Scrooge’s one-time love, displays a lovely soprano in the reprise of “A Place Called Home.” Her duet partner AJ Whittenberger playing the young Scrooge, also delivers well in that song and both display warm onstage chemistry. Mr. Bosley-Reynolds as Scrooge uses his commanding voice well, particularly in “Yesterday, Tomorrow and Today” late in the second act. The entire talented company makes this production a winner. It’s too large a cast to name everybody, but other notable performers include Jeffrey Shankle, Darren McDonnell, Tina DeSimone, Justin Calhoun and Chris Rudy. David A. Hopkins’ imaginative set design is exceptional. Many clever props and furnishings are used onstage and create the needed ambiance for 19th century London. Street oil lamps, vendor carts, wagons, bank teller windows, an oversized turkey, and a dancing skeleton add to the joy. A clock on a façade provides a terrific effect of the ghost’s faces projected on it when the ghost of Marley warns Scrooge of the three visitors he should expect overnight. And oh, that fog! The fog machines are in full throttle, and it appears that the action is taking place in the marshes of Dickens’ Great Expectations! Coleen M. Foley handles the lighting expertly, and with the light cast on that fog it presents an eeriness key to the atmospherics. Ms. Foley also conveys the right effects for the appearances of the ghosts. As good as this show is I must heap effusive praise on the extraordinary costuming designed by Lawrence B. Munsey. He meticulously put together a wide variety of 19th century Victorian costumes for the large cast with many attired for multiple roles. 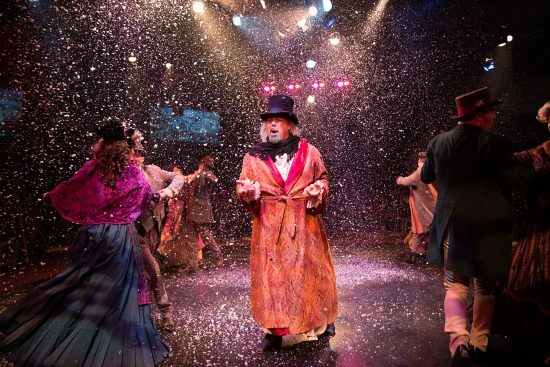 Toby’s stunning, well-staged production of “A Christmas Carol, The Musical” is enjoyable theatre, and it sends the right message as to how the “spirit’ of Christmas and the holiday season in general ought to be. You should catch this classic to liven up the season and enjoy Toby’s scrumptious buffet as well. Running Time: Two hours with an intermission. “A Christmas Carol” plays through January 8 at Toby’s, the Dinner Theatre of Columbia, 5900 Symphony Woods Road, Columbia, MD 21044. Tickets can be purchased by calling the Box Office at 410-739-8311, 1-800-88-TOBYS (8-6297) or online . Steve Charing is a journalist who blogs about issues important to the LGBT community and writes theatre reviews. To read some of his latest work, check out his blog.